On Sept 13, 2012 Fitness Baron published an in-depth article setting out 2 options for building a home gym primarily designed for weightlifting. 2 optional cardio options are included as well. 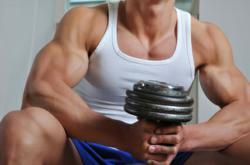 The article focuses on home gyms for weight lifting and bodybuilding. Fitness Baron's article on 2 home gym options that won't break the bank include a suggested complete home gym equipment set that enables users to execute dozens of weightlifting exercises for both upper and lower body. The particular complete home gym was profiled because it primarily uses free weights instead of bands and/or cables. Fitness-Baron.com refers to the complete home gym option as the buffet home gym option. The second home gym option outlined by Fitness-Baron.com is buying different specific-use weightlifting equipment. The in-depth article doesn't set out the ultimate home gym that would cost tens of thousands of dollars. Instead, it's intention is to profile the basic weightlifting equipment one needs to set up a home gym that will provide the most bang for the buck and enable users to do the fundamental weightlifting exercises such as bench presses, light squats, and of course all the exercises one can do with a 90 pound dumbbell set and 300 pound barbell set. Fitness-Baron.com is a fitness website with a weightlifting bent, but also covers cardio, weight loss and yoga ... mostly from the weight lifter's perspective. Started in 2012, Fitness-Baron.com seeks to inform readers about building quality muscle based on actual experience in the gym. Fitness-Baron.com also gives away 42 free workouts to help any beginner or intermediate weight lifter get going with proven weightlifting and bodybuilding workouts. The 42 workouts include toning and lean muscle options as well for those who don't wish to build a massive physique. For more information, read the full article on creating a home gym by Fitness Baron here.